Former President Nelson Mandela announced that his eldest son died Thursday of AIDS-related complications, saying the only way to fight the disease's stigma was to speak openly about it. 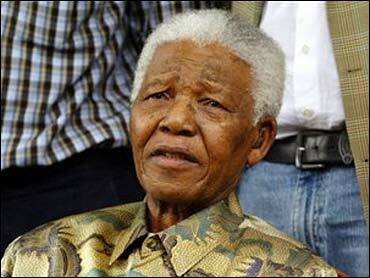 Makgatho Mandela, an attorney, was admitted to Linksfield Park Clinic last month. He died at age 54. "Let us give publicity to HIV/AIDS and not hide it, because the only way of making it appear to be a normal illness, just like TB, like cancer, is always to come out and say somebody has died because of HIV," Mandela said at a news conference at his residence. Mandela said he had been unaware of his son's illness when he began lobbying for more openness about the pandemic some three years ago. "I hope that as time goes on, we realize that it is important for us to talk openly about people who die of AIDS," Mandela said. Mandela's position contrasts with that of President Thabo Mbeki, who has denied knowing anyone who died of AIDS. Mandela declined to comment on Mbeki's views. More than 5 million of South Africa's 45 million people are infected with HIV, the virus that causes AIDS, more than in any other country. An estimated 600 die of AIDS-related complications every day. Mbeki's government has been criticized for its sluggish response to the crisis and for courting dissident theorists who question the cause of AIDS. Until this year, the government refused to provide life-prolonging anti-retroviral drugs through the public health system, citing concerns about their safety and cost. Nelson Mandela, a frequent visitor at his son's bedside, was surrounded Thursday by somber relatives, including Makgatho's only surviving sister and two of his sons. Mandla Mandela, Makgatho's son, described his father, a quiet and private man, as a loving figure and "the pillar of our strength." Makgatho was one of four children from Nelson Mandela's first marriage to Evelyn Mase, who died in May 2004 at 82. Of the other three children, a daughter died in 1948 before she was a year old, and another son was killed in a car crash in 1969, while Nelson Mandela was in prison for 27 years under apartheid. Last year, Makgatho Mandela's wife, Zondi, died of pneumonia. The couple had three sons. Mandla is the only child from an earlier marriage. A memorial service was planned Jan. 11 at a venue to be decided. Makgatho Mandela will be buried Jan. 15 in the family's home village of Qunu in the Eastern Cape province.